Experience Myokos amazing hot springs. Myoko is home to many hotsprings. There are public onsen and onsen that are part of a hotel. The onsen in hotels can be used even if you are not a guest of the hotel. 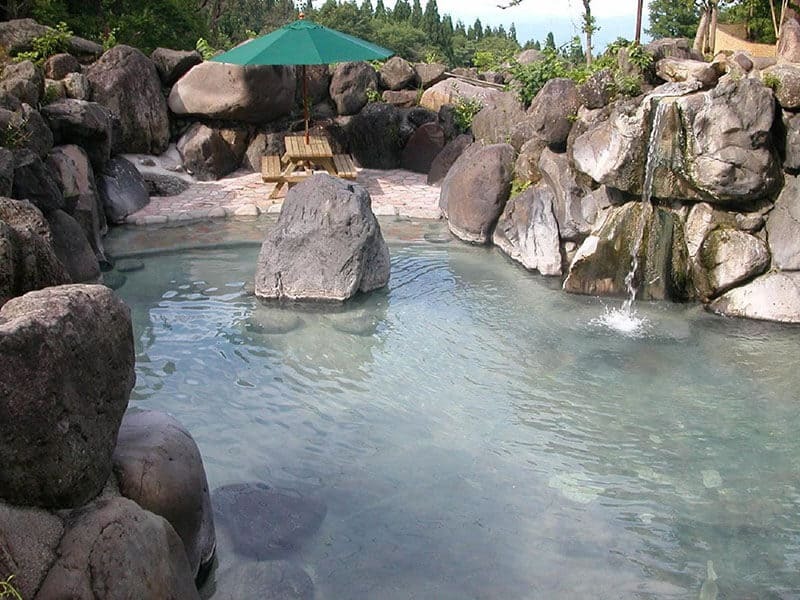 The amazing outdoor onsen at Tsubame are probably the most famous in Myoko and they are free to use. Check out our Tsubame onsen page here. 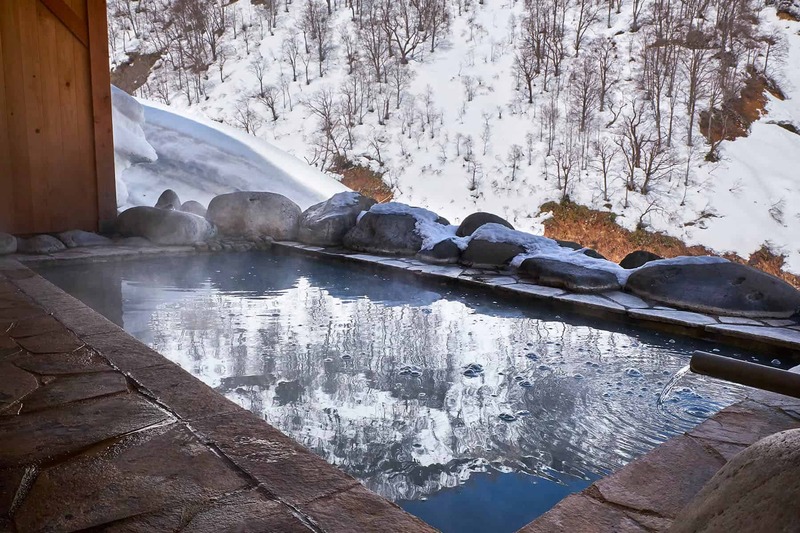 Myoko has seven different onsen areas which all have their source deep in Mt Myoko. Although the areas are all served from the same mountain the waters in each area are very different. This is what makes Myoko such a great place for experiencing onsens, every area will offer you a different type of bath. There are five different kinds of onsen in Myoko. 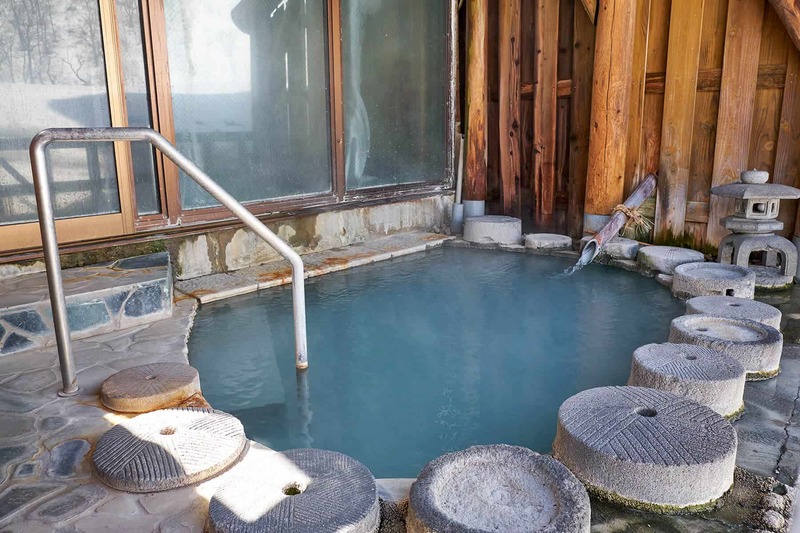 The onsen are defined by their mineral contents and appearance. Each type of onsen offers differing but great health benefits for the skin and body. There are three different colours of water that emerge from the Myoko hot springs. Tsubame area has a beautiful milky white colour. Seki has a reddish coloured water, Ikenotaira has a black coloured water which is the colour of the minerals floating in the water. Akakura and other areas have a clear water. 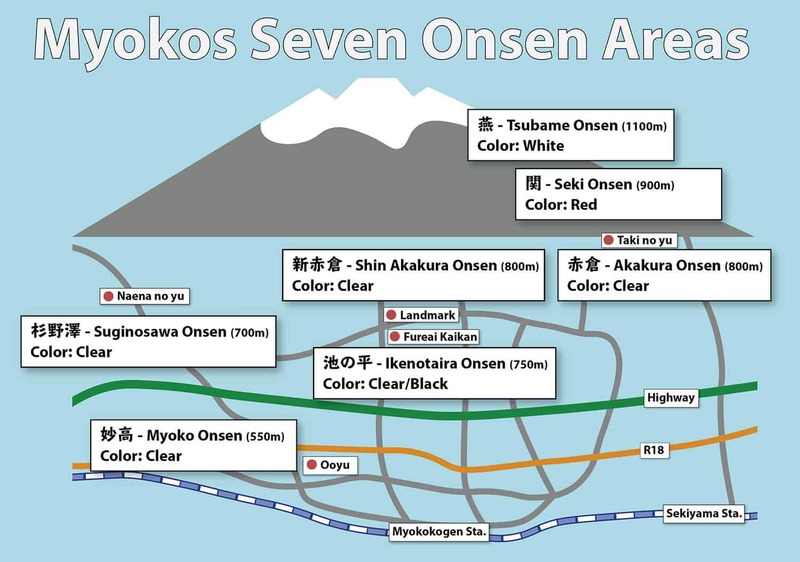 Below is a map showing the seven different onsen areas in Myoko. The public baths are also displayed with a red dot and the onsen name. 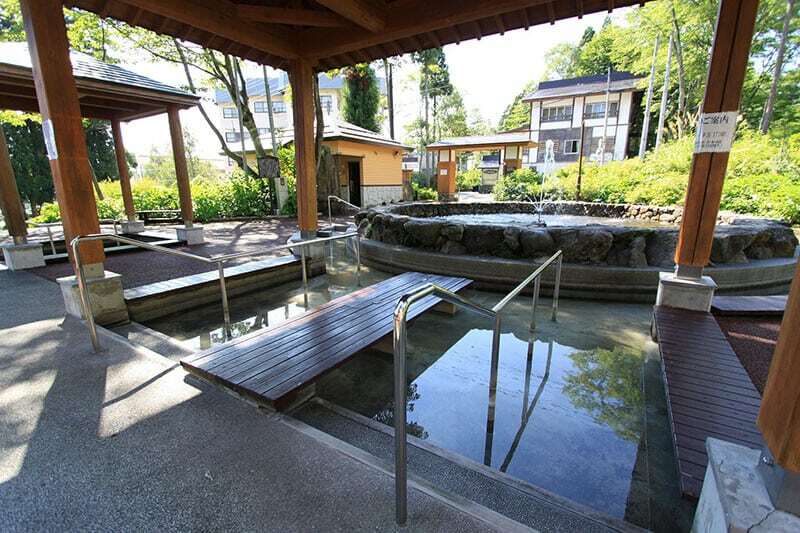 In each area there are many hotels with onsen baths you can use. Below, each area and the hotels are listed with their opening times and price. Set on a spectacular cliff-side the outdoor baths at Tsubame Onsen are a great destination for those who want to get off the beaten path. The small hotel area and surrounding mountains and forest offer a pleasant atmosphere. The outdoor onsen close during the heavy snows of winter, but the onsen in the hotels are open all year round. The hot spring water is milky white, and offers great benefits for the skin. Seki Onsen opened in 1729 and is the oldest of all hot springs in Myoko. The traditional village area still carries the atmosphere of past times. The area is popular in winter as the small Seki Onsen ski resort is famous for its deep powder snows. The reddish onsen water gets its colour from the high iron content in the water. The iron has a heating effect on the body which is particularly pleasant in winter months. The outdoor baths of the hotels are closed in winter. Akakura Onsen is the largest onsen area in Myoko and opened in 1816. The area becomes hugely popular in the winter months which is great time for tourists to experience the amazing onsen in the area. With many different onsen to choose from you could try a different bath each day. You can see the floating minerals in the clear water. This is called Yubana in Japanese. Shin-Akakura Onsen uses the same hot water source as Akakura Onsen. The mineral rich waters are great for the skin and contain other healing properties. 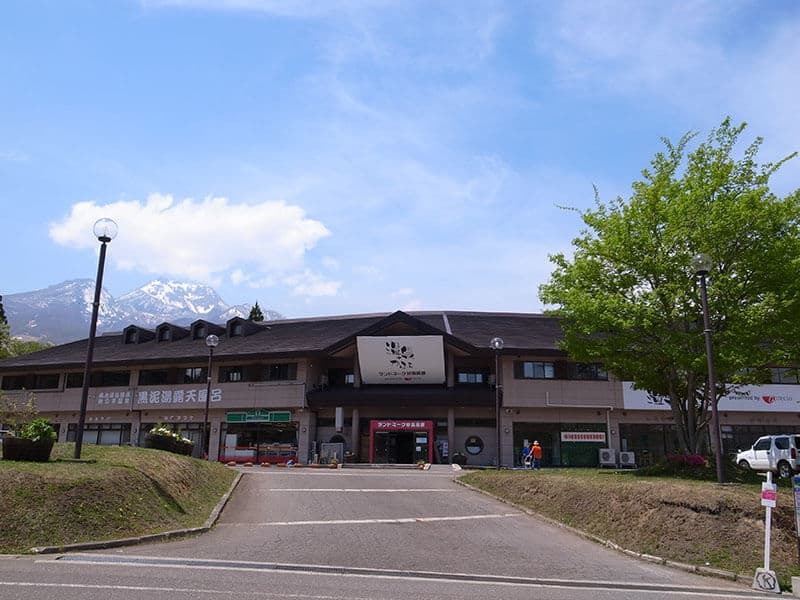 Myoko Onsen is just 15 minutes on foot or 3 minutes by car from Myokokogen Station. 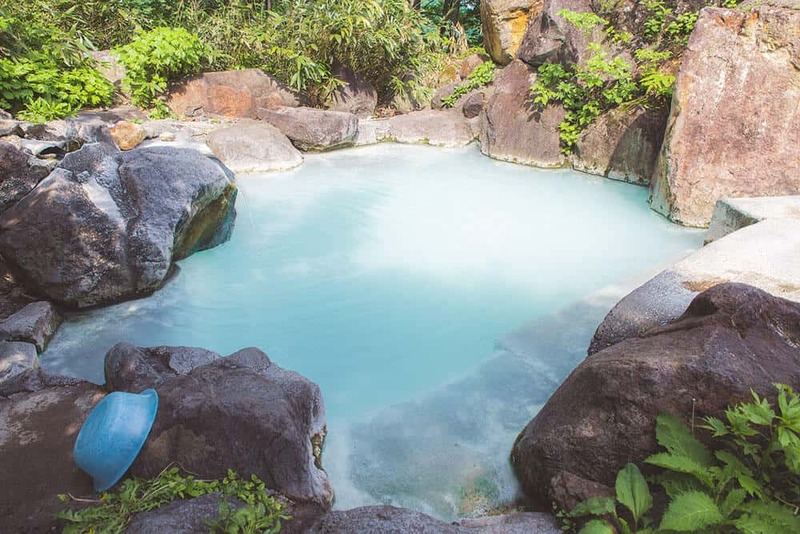 This hot spring area shares its source with Ikenotaira Onsen and provides a soft and gentle water that is great for the skin. Ikenotaira shares its source with Myoko onsen area. Landmarks onsen have a black coloured water. This comes from the heavy mineral content that floats in the clear waters. Landmark is open 24hrs during the winter season and also offers an internet cafe area, pool tables, table tennis and other amusements. You pay per hour for free use of all the facilities. The brand new Lime Resort Myoko have also opened their beautiful new baths to the public. They have a variety of different indoor baths as well as an outdoor bath. Fureai Kaikan is run by Myoko City as a public bath and is located down the hill from Landmark and the ski resort. Suginosawa is the newest onsen area in Myoko. The clear mineral rich waters offer great benefits to the skin. The onsen in Suginosawa is a public bath called Naena no yu which is available to all. It is closed on Wednesday but during the winter season it is open everyday.